You don’t have to be a web design expert to know that the web is ever-changing. Technology constantly evolves. Any company that wishes to either “get in the game” or “stay in the game” must keep up with these changes. This is not “keeping up with the Joneses”, but a necessary effort to anticipate and meet the customers expectations. Meeting and exceeding those expectations is extremely important when planning a franchise network website redesign. Are customers looking up your services from a mobile phone? Then your mobile presence can’t be an afterthought from behind your designers’ 30” monitor. Are you fighting over marketshare with other local players? (And, who isn’t?!). Then your webpage better do a mighty fine job at winning your prospects’ trust and – ultimately – business. PuroClean is a fire and water damage restoration company, as well as a mold remediation company. This property emergency services powerhouse operates as a franchise-based model, with over 250 franchises throughout the United States and Canada. PuroClean is well aware of what the web landscape is like out there, as well as the needs of both its franchisees (whom they serve) and of their customers (whom they market to for their franchisees.) So they decided to do a complete redesign and redevelopment of all their corporate and franchise network websites. And they hired us to do it. 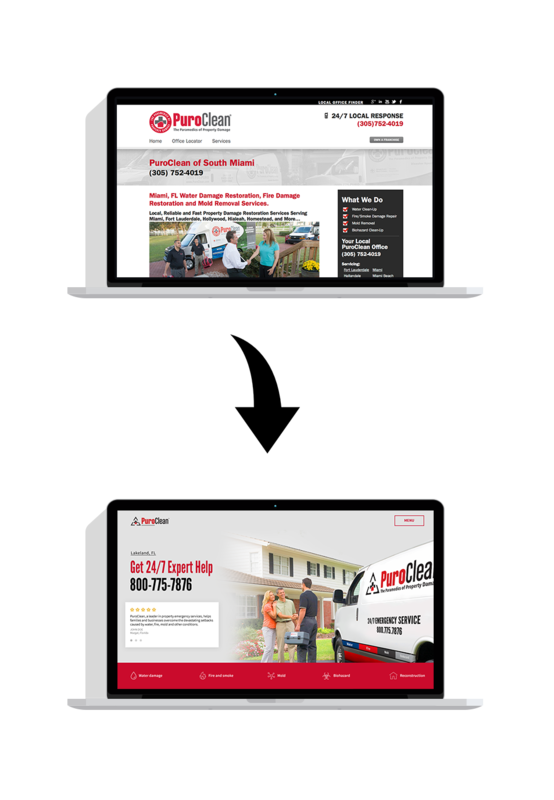 As do many other franchise networks with a strong focus on branding, PuroClean’s old website consisted of a “main” website that served primarily as a “home base” for all their websites. Within this website, each franchise had its own landing page, that acted as their local “homepage” and where all their localization happened. And that is really hard to work with as a local business. Stuffing all your information in a single (mostly) text-driven page is not how modern websites win clients. Sure, they may drive some traffic to the page (provided the owner put in some work to “localize” their page), but what about focusing on the client? How about conversion? The design wasn’t customer-centric, and didn’t cater to a 2018 mobile-first audience. It also didn’t focus on conversion. It was built on the typical approach: here’s everything you didn’t know you didn’t want to know about us. Lots of features and benefits, text nobody reads and other design “fluff”. Our design solved the main problem by awarding franchisees their own full website hosted on the main PuroClean website and domain. They went from an individual page to having their own pre-populated website, where they can publish blog posts, and perform local SEO tasks. As this is a consumer-centric site, we followed a mobile-first model, ready to engage consumers in the midst of a disaster emergency. The PuroClean website redesign was challenging, not only because of the scale of the site itself (over 200 websites!) There was a catch. We were given a very tight time constraint for this project. From start to finish, we had 4 months. With the growing number of PuroClean franchisees and the need for more digital space for every local business to promote their services, the company aimed to unveil the new websites during their Annual Convention. If you’ve ever been involved in a web design project (even as an innocent bystander), you know that there’s no such thing as a “quick redesign”. A small website (less than 20 pages) takes about 16 weeks when all goes smooth. The larger the company and the more people involved in the process, the longer it takes. The PuroClean project was certainly not a “quick redesign” job. It involved a complete new design, a change of platform (from Drupal to WordPress multisite), as well as migrating each one of the over 200 franchises from a single-page format to a multi-page sub-website. So how was it possible to redesign their website in 4 months? (And do that, of course, without cutting corners or a huge team.) Of course, there was our pre-existing, ongoing relationship with PuroClean. For over 4 years, we worked with them, including directly with Headquarters, with several of their franchisees, and with their Franchise Development department. We knew their business and brand very well and we had a good understanding of the needs of both franchisor and franchisees. And, we were directly involved in their rebranding process, in creating their social media presence. So we’ve been creating content for them, as well as acted as an extension of their internal marketing department since 2014. 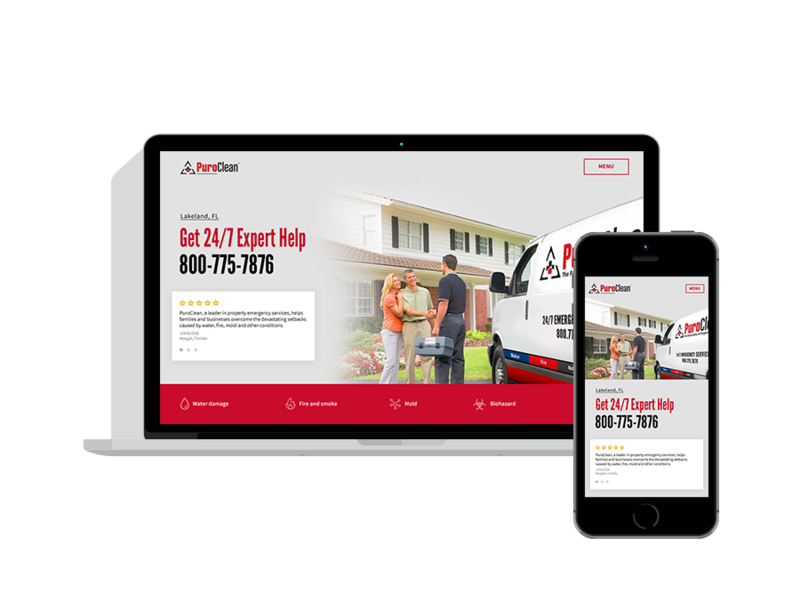 Our design team worked closely with the client’s marketing department to produce interactive prototypes before the design stage of the website. Every page on the website interface was tested and evaluated for usability. Franchisees’ existing profiles and assets were analyzed to determine how the final pages for each business would convey the brand’s message. Their requests for pages where they can upload award badges, personal success stories and localized information were the driver for the prototype. We aimed to turn homeowners in the midst of a property damage emergency into customers by allowing them to skip a few steps to get to their local “paramedic of property damage”. 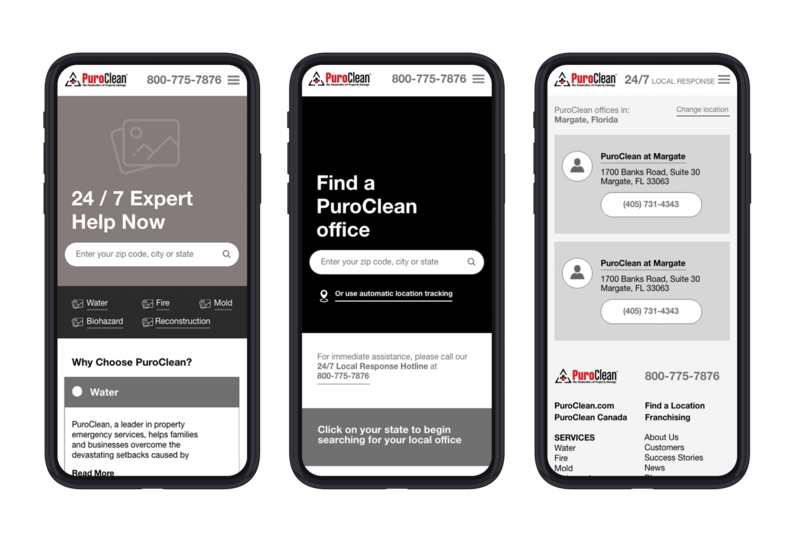 Every new customer’s location is tracked, and they are immediately redirected to the PuroClean franchise servicing their area. If tracking is inactive, a search for a local franchise or “Call Now” are the main calls to action that stand out on the PuroClean website. In order for the focus to remain on the main calls to action, we hid traditional menu elements, like company information, into a collapsable menu. Reducing friction and improving the website’s conversion rate were our main aims. Therefore, we steered clear from distracting visuals, unnecessary actions and decisions and a visually cluttered interface. Every page includes an FAQ section, in an effort to answer common questions about the process that customers may have to go through. Testimonials and success stories describe difficult situations in which potential website visitors are in. They also show how those were solved by PuroClean professionals. Since we had previously created a branding manual for PuroClean, we revamped the existing website to follow the established brand guidelines. Our main goal was to combine attractive imagery with white space, keeping the focus on the brand’s content and messaging. Keeping the color scheme to a white, red and black, we looked at images which would relay the concepts of clean, tidy, peaceful. While PuroClean deals with property disasters, they are the professionals who remediate it, so giving prospective customers peace of mind was important. 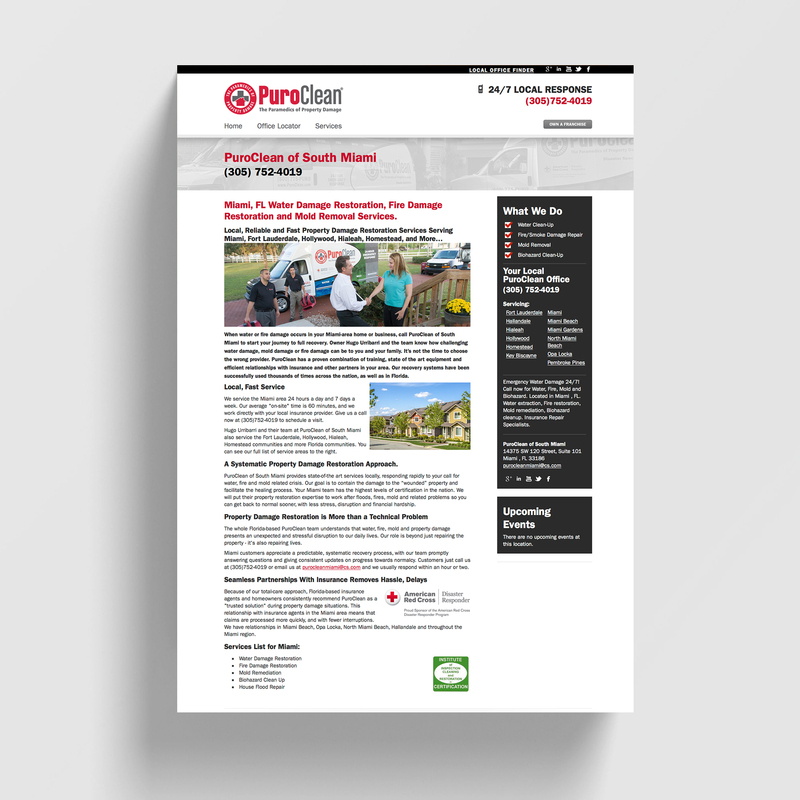 In order to reassure potential users of PuroClean capabilities, we included: successful projects, company history, and testimonials from satisfied customers on several pages. Our goal with the PuroClean franchise websites was creating easily managed sub-websites for each business. That includes a separate About page, to include information about each specific local business. It also includes pre-populated service pages, and blog posts republished from the main PuroClean website. While that information was previously relayed on a single page, it is now expanded, explained and categorized. Franchisees can add new blog posts and tailor information on any page to their local area. They can include local awards, as well as company bios and testimonials to boost their credibility. With the PuroClean successfully launched, we will continue to be there for our clients every step of the way. We do that by offering them the needed expertise and support to ensure their website continues to serve them well. That includes all the necessary updates and upgrades, as well as developing and integrating new features and technologies. We are confident that the WordPress Multisite platform will allow for proper scaling throughout the coming years.